Autodesk Vault 2013 Service Pack 1 wasn’t released until quite late in the year of 2012. Fortunately, some of the major issues with that release were promptly taken care of within a few months of 2013’s release, having the first service pack release 9 months after the product was launch (based on annual release cycles) is quite late. Moving into the present, Autodesk Vault 2014 is a nice release, it has a number of welcome improvements but as if often the case with new release software there are issues. Thankfully Autodesk have really stepped up to the mark this time around, having already released Update 1 in short order post the products release, a few days ago they released Autodesk Vault 2014 Service Pack 1 for all of the editions (Basic, Workgroup & Professional). I’ve been quite critical of the Vault team in the past (even though I generally really like the product), so it’s only fair I give them some kudos for the speed with which they have reacted to these issues. I’m not going to detail all of the fixes here, since you can read them in the service pack’s readme file. However, I will highlight one fix (I haven’t managed to test it yet) which I feel is a significant flaw in the 2014 RTM release. 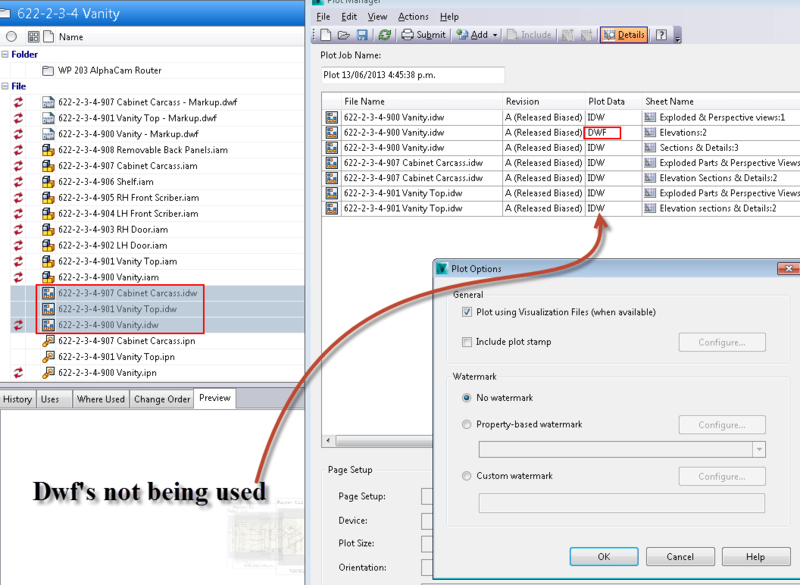 When using the plot tool, even when dwf’s/visualisation files are up to date, it defaults to printing with the CAD file instead & in some cases where it has managed to load the dwf, Vault fails to print that sheet with no obvious error. It’s not until you check the physical drawings that you notice they are missing, however, I did discover a tool you can use to check for errors. 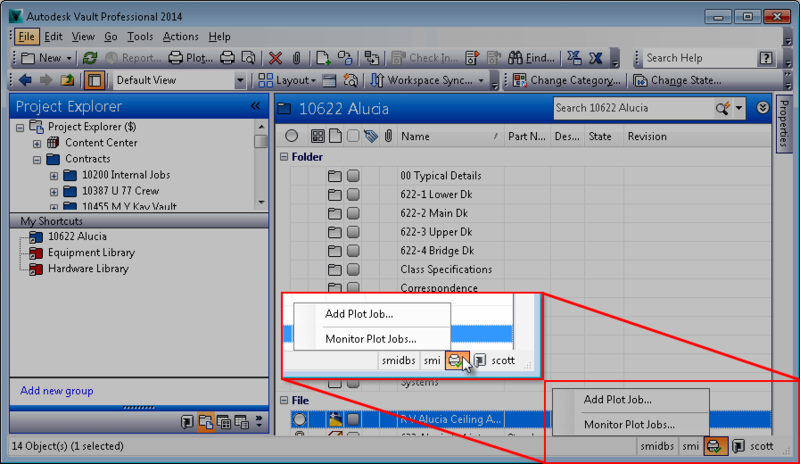 Once you have printed a job, an extra status icon appears in the bottom right hand corner of Vault Explorer, left clicking on it gives you the option to load the Plot Job Monitor. IDW printing requires more system resources (CPU usage, memory) than DWF printing. If the DWF has “mark-up”, it doesn’t print when user uses idw printing. Using DWF’s Saves printing time. There’s no need for usage of any CAD licenses. Scanning through the Readme file for Autodesk Vault 2014 Service Pack 1 reveals an issue having been fixed relating to DWF printing on 64-bit operating systems. I believe this fixes the issue I’ve highlighted here. There are a satisfying number of fixes in this Service Pack not only for the Server (ADMS) but for the client and a number of the Vault add-ins. 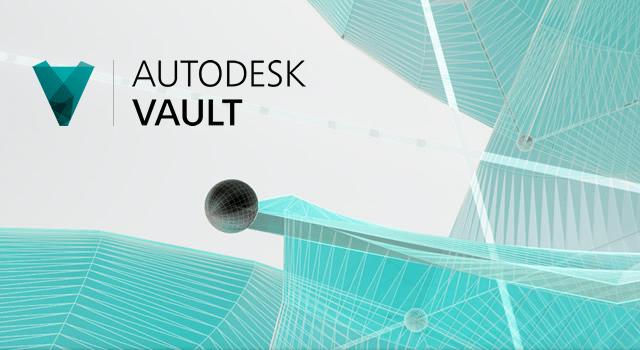 You can download Autodesk Vault 2014 Service Pack 1 from here. Just make sure you carefully follow the installation instructions when you do so. If you are interested here is a summary detailing a number of the fixes released by Autodesk recently.